"It's Monday! What Are You Reading?" is a weekly link up hosted by the wonderful Sheila at Book Journey. Each week, we share what we read and what we are reading! I totally think you should join in on the fun! Wowza! I haven't linked up in awhile. It's not for lack of reading but just due to being a bit distracted with other commitments but I've missed you all! 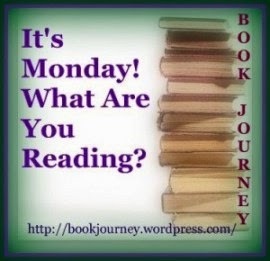 I can't wait to see what you are reading this week! I think I have embarrassed myself enough already. So, we have a new book store in Central Phoenix. Well, Changing Hands isn't NEW to the valley- just new to the city. When I first began reviewing books on my blog, I had been invited to several author events by publishers (think Michael Connelly and other known authors) to Changing Hands but it was just way too far for me to go to. It opened on Friday and I decided to swing by on Saturday. It is going to be an AMAZING destination spot. It is in the spot of a former restaurant that was a huge staple in the valley and when this concept was built, they did keep many of the key pieces of Beefeaters restaurant. Changing Hands book store sells new and used, a huge venue area for literary guests and book clubs (I hope! ), and First Draft (a beer, wine and coffee bar). Here's a write up of it in the New Times. So back to my point, I went in on Saturday. It was PACKED. My heart was leaping with joy. The store was bustling, the patio was HUGE but not packed (waaaayyy too hot to sit outside) but the bar was packed. I am so excited. We have many great local spots to visits and to have them in the heart of the city is an extra piece of excitement. LOCAL BUSINESSES ROCK MY SOCKS. So, while I was there, I picked up Matilda for Emma, and I picked up the third book in the Wheel of Time series (Dragon Reborn) and The Allow of Law by Brandon Sanderson. (See? I was going to return to why I mentioned him. Haha). When I was checking out the cashier asked me if I read the "Mistborn" Trilogy by Sanderson. You do realize what happened next right? Yeah. I went fangirl in the middle of the book store with 15 people behind me. Ha. Needless to say, I told him about Elantris and he is picking it up. haha. I told him that the next time I come in, we must talk geek, er, I mean shop. Yeah. Talk shop. So, needless to say... 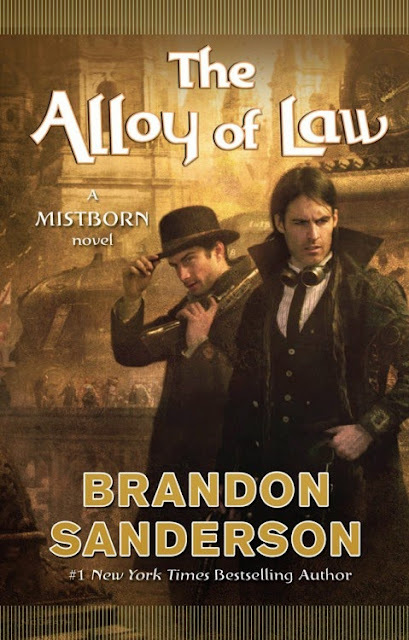 I am reading "The Alloy of Law" this week! So, if they bring in Brandon Sanderson- I am going to go batshit crazy and will be first in line- even if I have to fight. Ha. So... what are YOU reading this week? On the Go Snack for Work and Play!